Art Supply Houston » Blog » Can You Frame a Canvas Painting? If you’re an avid painter who loves to work on canvas, you probably have several finished works sitting around your home or studio. Maybe they’re rolled up or stacked in a corner somewhere. If that’s the case, then it’s a real shame! After all, you’ve worked hard on your craft, so why hide it? You need to show your canvas paintings to the world! To make that happen, it’s time to learn how to frame canvas. Depending on your original material and personal taste, there are a few ways to go about getting your work ready for display. One thing you need to know is that you can absolutely frame a canvas painting. Jerry’s Artarama put together this handy post to help you learn more about your options. Your first decision is a matter of personal taste. Many people like the look of unframed, stretched canvas. It’s minimalist, modern, and it’s inexpensive to just hang your work to let it stand on its own. This is a good choice for artists who work with rolls of canvas and stretch it on their own. That’s because you can size the stretcher bars so that the painting “bleeds” around the sides. This is like having an invisible, built-in frame for your work and leaves nothing to distract from your art. It’s a decidedly modern look and is also pretty popular these days. On the other hand, artists working with pre-stretched art canvas will likely want a frame, since they don’t have the option to easily paint around the edges of the canvas (though you could paint a solid border on the edge of the canvas if you like). You’ll need an open-backed canvas frame to hold your artwork instead of a glass-covered frame. Look for styles that come with a groove and clips to hold your canvas in place. If you have a standard sized pre-stretched canvas, it should be easy to find a ready-made frame to fit. When in doubt, you can always speak to the friendly and knowledgeable staff at your local art supply store. They can help you find exactly the right size to perfectly house your art. On the other hand, if your canvas is a unique size or shape, custom framing may be your best option. This also allows you to choose a linen liner to serve as a mat between the frame and the canvas for additional texture and visual interest. While many artists are comfortable stretching the own canvases, it’s usually best to leave framing to the professionals. A professional framing service like the one you’ll find at Jerry’s Artarama will have a wide selection of frames along with the specialty tools needed to precision miter cuts. 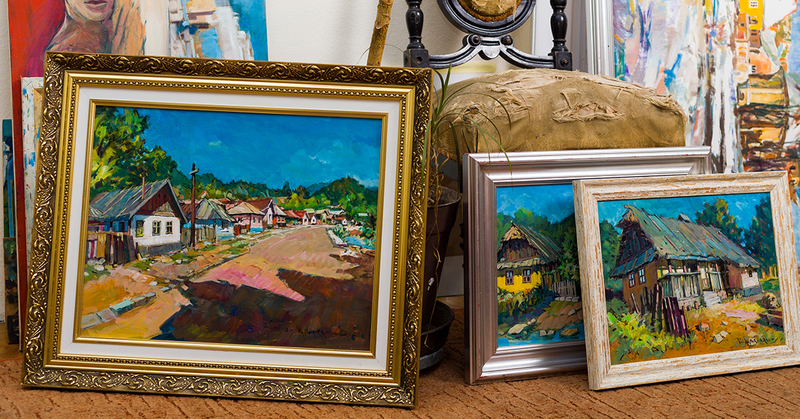 With the right custom frame, you can perfectly accentuate your art while protecting it for years to come. Work with a local art expert to determine the right color and style of frame to complement and bring out the best in your canvas painting. Whether you’re interested in ready-made frames or custom framing for your latest canvas, Jerry’s Artarama has you covered. Come by our store with your work to learn more about our comprehensive framing services and put the finishing touches on your work of art.